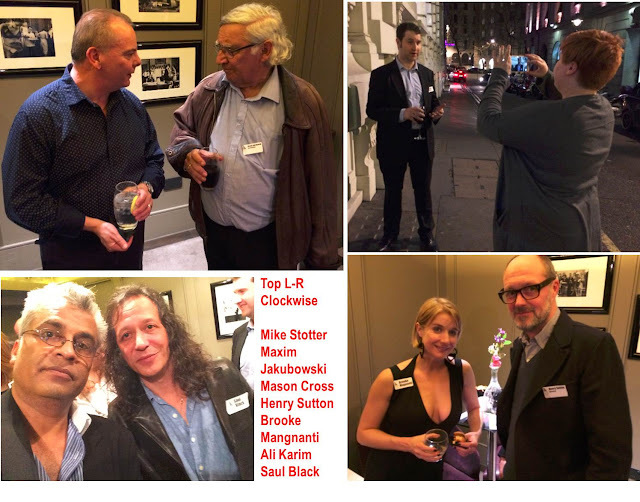 The final treat to a long and interesting day, was the invite from Angela McMahon to Orion Publishing’s 2016 Crime & Thriller Party, held in Covent Garden London. The team from Shots lead by Editor-in-Chief Mike Stotter, and Uber Blogger Ayo Onatade met up earlier for lunch; thanks to Thomas and Mercer to celebrate Leigh Russell’s launch of her new novel Journey to Death. We were excited to see what Orion Publishing had in store in terms of Crime, Mystery & Thriller fiction for release in 2016. Not only is the anticipation of fine, incisive and disturbing excursions into Literature’s darkest streets of great interest to the reading public, but is [apart from Children / YA], a key area for publishing, for it can lead to volume sales; but that being said, there is also the management of risk to consider, for when faced with volume-sales, the margins can be slim, so decisions within a publisher such as Orion, can be tough. 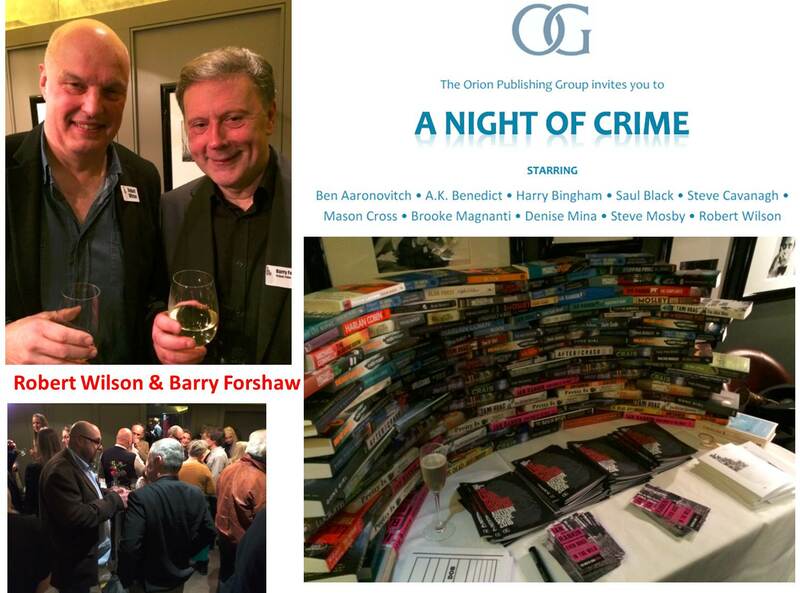 The problem I allude to relates to the calibre of the talent in its stable of authors, for Orion publish some of the biggest names in crime and thriller, from America and the UK. Though celebrating the best crime, mystery and thriller fiction one is never partisan to any publishing house, but rather to the book, or author, I do however hold a soft spot for Orion Publishing, for it was this important division within the Hachette Group, that gave my first opportunity to meet [and interview], Michael Connelly [for Mike Stotter and Shots Magazine], many years ago, and from that meeting, I came on-board the editorial team, as Shots transformed itself from a paper magazine distributed on news-stands, to an ezine – as the Millennium approached. In the opinion of many critics, Michael Connelly is considered the greatest living writer of Police Procedurals, with his long standing Harry Bosch novels, which are in the process of being televised with exceptional film values. Many of us are excitedly anticipating season two of Bosch, from Amazon Prime’s steaming service. I had been fortunate as Assistant Editor at Shots [together with Larry Gandle, Assistant Editior at Deadly Pleasures Magazine], to be invited to Los Angeles after late year’s Bouchercon to visit the location shooting of episode 7, of Bosch Season 2 in Venice Beach. We were also amused with the recent exploits of “Basil” and his elderly crew of Jewellery thieves [that carried out the Hatton Garden theft], were allegedly inspired by Connelly’s debut Harry Bosch novel, The Black Echo. Richard Hoskins, an independent criminologist, said there were “curious and numerous” parallels between the heist plot in The Black Echo, investigated by Harry Bosch, Connelly’s detective protagonist, and the recent London theft. So as I took the tube into town, my mind reflected back to why Orion Publishing’s contribution to the Crime, Mystery and Thriller Fiction genre should not be solely focused on their pool of authors, as impressive as it maybe; as we should focus on the perturbations, ripples to the genre, Orion Publishing’s crime-list produces. I recall lucidly the Orion Party at The Top of the Riv, during Bouchercon Las Vegas in 2003, for it was there that David Morrell and Gayle Lynds first met, and a group of us, including Lee Child, Ian Rankin, Steve Hamilton, George Pelecanos [amongst others] debated the importance of ‘The Thriller’ as a sub-genre that striated itself across fiction publishing. 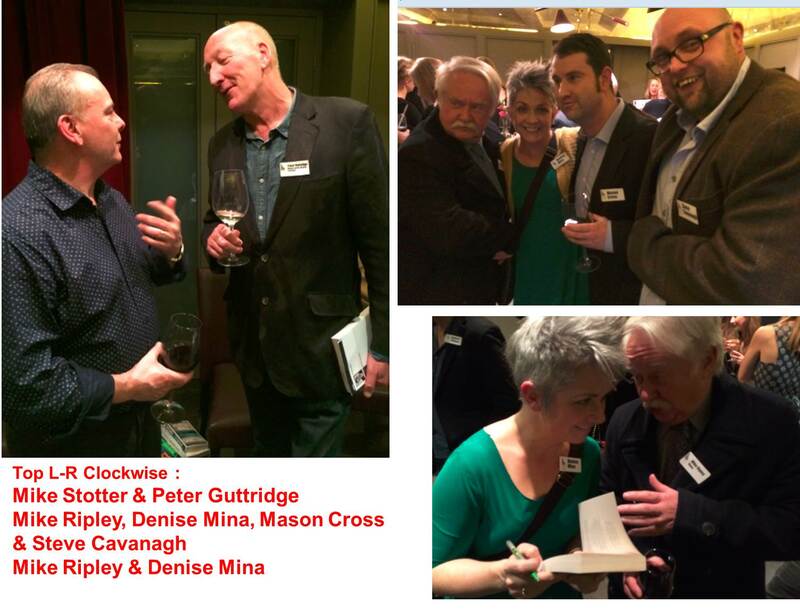 And from that serendipitous meeting, the seeds for International Thriller Writers Inc were sown, as David and Gayle assembled a formidable team to help support the Thriller, in terms of sub-genre, and giving it the respect it is often denied from other, ‘loftier’ sub-genres, by some in the Literary [note capital L] circles. ITW is indeed in rude health, now in its second decade as an official organisation, with its own annual gathering / convention, Thrillerfest, as well as a range of ITW publications. 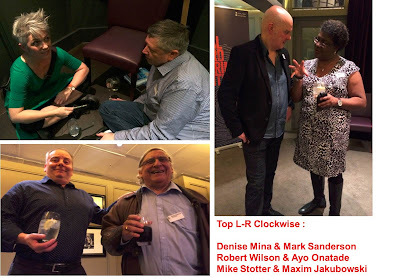 So clutching our invitations, Mike Stotter and I left the pub we spent the afternoon in, and headed back along Long Acre, in London’s Covent Garden district to the venue that Orion had organised to showcase what lay in store in terms of their 2016 publishing schedule. We arrived and met up with Steve Mosby, first. Steve has now been a long standing author with Orion’s stable first coming into prominence in 2004, when he was one of 12 new authors Orion brought in as ‘new blood’, with his debut The Third Person. 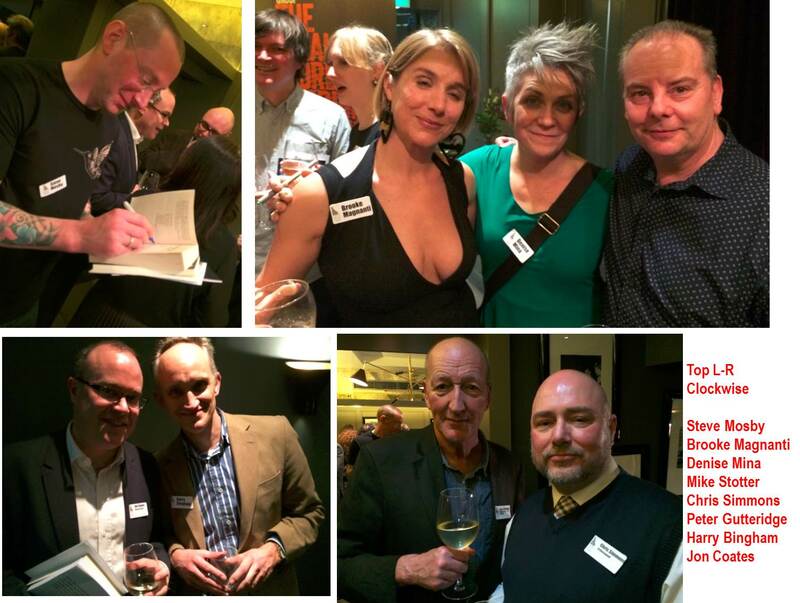 We’ve been busy of late as last week we attend Penguin’s Michael Joseph Crime and Thriller Party, and earlier in January, we attend fellow Hachette Publishing’s Hodder& Stoughton, Headline, Mulholland, Quercus Party. One of the delightful aspects of getting an invitation to one of these trade crime parties, is the mingling with colleagues, friends and acquaintances – all who share the passion for the darkest edges of literature, and so can speak freely about the genre, without feeling that one should be wearing an anorak, and have the words ‘geek’ stencilled to ones’ forehead. I was delighted to see such an invigorating array of Orion’s authors, editorial and promotional team on hand, as well as an eclectic array of London’s Literary community, reviewers, commentators, editors, bloggers and journalists – including some from Orion’s sister imprints, such as [Victor] Gollancz and Weidenfeld and Nicholson – in fact two of my favourite thrillers of 2015 were from Orion and W & N as reported at The Rap Sheet’s end of year ‘best of listing’. Orion had organised The Club Room, in Covent Garden’s Christophers American Bar and Grill, which had its own bar, and the canapes were excellent, as was the company assembled by Angela and the team. 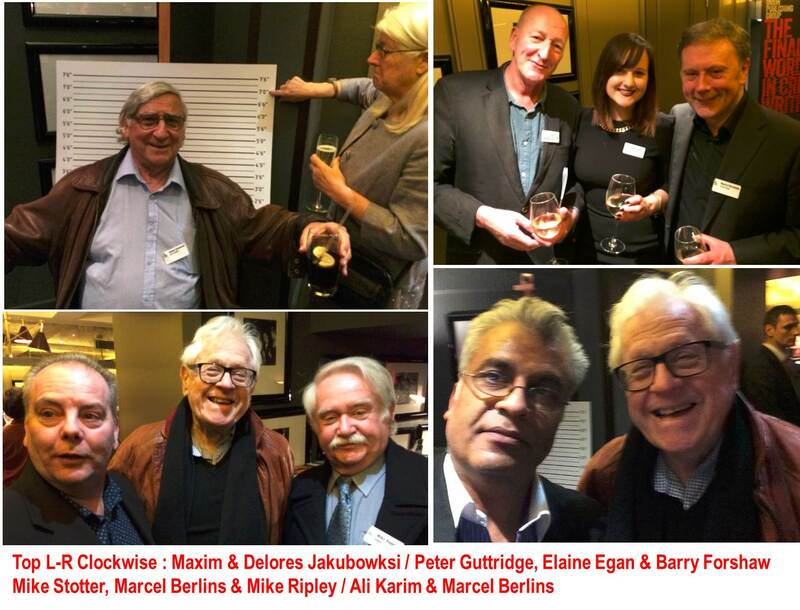 The London Literary community were very relieved to see Lawyer, Journalist, Broadcaster, Literary Critic, Marcel Berlins in such rude health at the party. Just before Christmas we were all worried at him being taken very seriously ill, so it was joyous to see him so well, fully recovered and in great form. Though due to his illness, he had to step down as one of the Judges for the Crime Writers Association [CWA] Ian Fleming Steel Dagger, and though I had originally planned to take a year off Judging for the CWA, following three years on the CWA Goldsboro Gold Dagger, I readily agreed to take Marcel’s seat, to assist CWA / Ian Fleming Publications at short notice, and catching up from Marcel’s readings and notes. I was also delighted to get a surreal reminder of my childhood, as I hadn't seen journalist, literary critic, writer, Mark Sanderson for a while, so it was good to bump into him again. 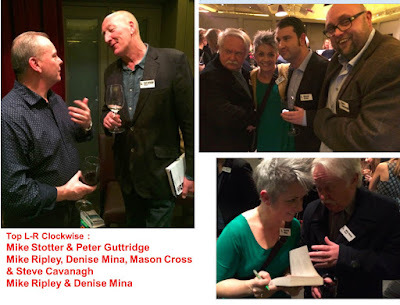 It was several years ago at a literary dinner, hosted by HarperCollins, I discovered that we both went to the same village primary school in Cheshire. Mark then went off to a private school, while I went to a rather rough state high school. It would be decades later, that we realised that we knew each other as children, and that we both became literary commentators and writers. 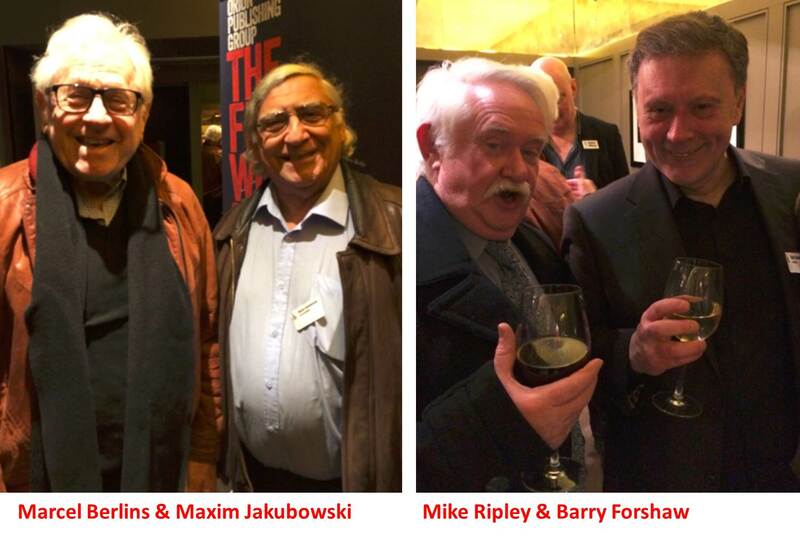 The Shots team of Mike Stotter, Ayo Onatade, Mike Ripley and I were delighted to meet fellow writers, literary critics and commentators Peter Guttridge, Barry Forshaw, Crime-Thriller Girl, Maxim Jakubowksi, Jon Coates, Milo Rambles and many many others. Orion Publishing assembled from their author list showcasing what they were bringing to market. Joining them I was delighted to Graeme Wilson who works with Orion Publishing’s Blog THE MURDER ROOM, Sam Eades, who we’ve known for some time, and who came up with the ‘signature game’, where each of us were issued an author ‘bingo’ card, and we had to get all the authors to sign our cards, for the chance of winning an Ipad. There were many others from the Orion, Gollancz and W & N teams on hand assisting guests select proof-review copies from the upcoming releases. I was delighted to congratulate my very dear friend and colleague Juliet Ewers in her recent promotion at Orion. I also wished to pass my very dear thanks for the many Orion Dinners she has invited me to at the various Bouchercon events, over the years. She was unable to make Bouchercon Raleigh last year, with her new role, but we both recounted the wonderful dinner at Bouchercon Baltimore in 2008, where she and Orion’s Kate Mills, had remarked to Harlan Coben and I, laughing along “…..Gentlemen, if Larry Block chokes on his food, laughing at your quick fire jokes and anecdotes, Orion will sue you both…….” I don’t think I have ever been invited to a dinner with such award-winning luminaries in the world of Crime and Thriller writing; as apart from Larry Block and Harlan Coben, I got to break bread with Roger Ellory, Linwood Barclay, Steve Hamilton, and the late Edward Wright – Click Here for a photo and information about the 2008 Orion Dinner in Bouchercon Baltimore. So after quaffing some excellent Gin, Angela McMahon used an old antique air-horn to usher the assembled for the speeches, with Publisher Jon Wood, taking to the stage to welcome us all to the 2016 Orion Crime, Mystery and Thriller Party. As ever Jon was concise, in his welcoming address passing the stage to Angela, who then indicated that all the assembled Orion authors would speak for 60 seconds, to tell us about what they have in store for 2016. During the evening it was good to talk to the authors in such convivial surroundings, many who we’ve have known for more years than we’d care to mention without a lawyer present, but as Marcel Berlins was around, that was not a problem. I was especially delighted to meet up with Steve Cavanagh, who has his debut legal thriller THE DEFENCE out from Orion currently, and his second THE PLEA out in May. We had a laugh about when we first met at Crimefest Bristol last year, and had a remarkable Saturday Dinner with an eclectic group, moderated by Peter Rozozsky of the Philadelphia PD and Detectives Beyond Borders Blog. It was good to congratulate the Mysterious Mason Cross, for having his latest thriller THE SAMARITAN become listed as one of Richard and Judy Bookclub reads. Mason, has forgiven me for the tough questions on the work of Lee Child, I set at the Crimefest Criminal Mastermind Quiz a few years ago. The 60 second pitches from the authors were split into two deliveries, with Angela McMahon holding a firm hand on the air-horn, as the Orion Authors introduced themselves and their work to the guests. So as the guests, authors and the Orion Team mingled, Angela with a toot from her air-horn announced it was time to see who had won the Ipad, from the ‘Bingo Card’ draw, with Juliet Ewers pulling the winner from the hat. A surprised Maxim Jakubowksi took possession of the Ipad, during which I heckled to Maxim “Speech, Speech, Speech!” – which made him smile, and he passed the prize to his wife the delightful Delores. Maxim, Delores and laughed recalling that it was Murder One, his old bookstore; that hosted that remarkable launch for Thomas Harris’ much anticipated release of Hannibal in 1999 complete with an Anthony Hopkins lookalike, Fava Beans and Chianti. It was great to get word from award winning thriller writer Robert Wilson on the continued popularity of his Charles Boxer series as well his extraordinary standalone Stealing People and his TV / Film adaptations. We were delighted to hear that Robert is coming to Bouchercon New Orleans, this Autumn - the biggest gathering of the crime, mystery and thriller genre, hosted by Best Selling Novelist Heather Graham, and her Louisiana team. I would urge those who share a passion for the darkest streets in Literature, to consider attending, and here’s the information, but you need to be quick, as the hotels are filling up fast. The Shots team thanked Angela McMahon, and her Orion Publishing colleagues for their hospitality in making their crime fiction party a remarkably interesting event, with many engaging books being readied for market; which when combined with Gollanzc and W & N imprints, makes for a formidable section of the Hachette Group.